You may want to discuss with your students how beavers function as ecosystem engineers, changing their habitat from forest to pond and swamp, affecting hundreds of species around them. Beaver pond and dam, Massachusetts. 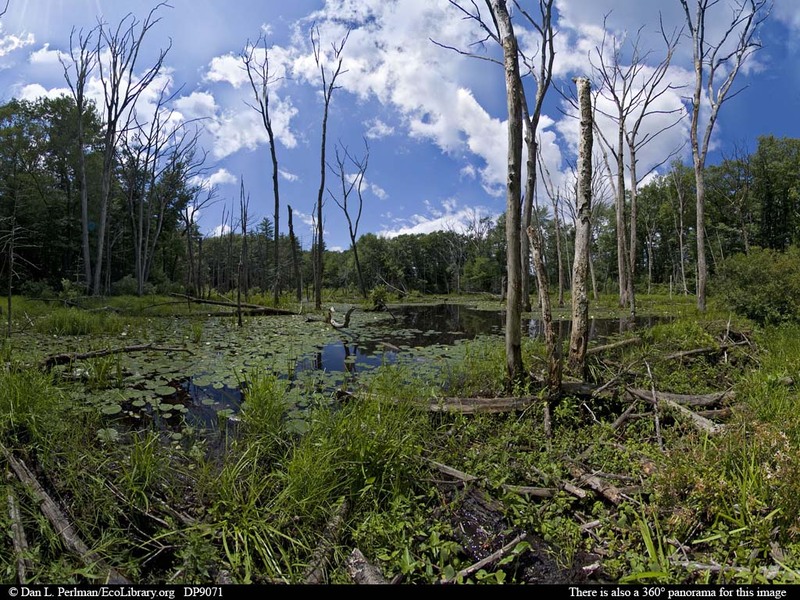 Beavers can have tremendous impacts on the ecosystems where they live, as this panorama shows. What was once a forest has been flooded and the trees have all died, due to a beaver family's damming a stream and creating this pond. With this change, many species of aquatic and wetland species gain new habitat. Eventually, when the beavers move to a different site, their dam will break, the pond will drain, and the slow process of succession will begin on the wet soil left behind. First a meadow will form, then shrubs and pioneer tree species will begin growing, and eventually a mature forest of late successional tree species will develop, decades after the beavers leave. Because of the profound changes they can spur, beavers are sometimes referred to as ecosystem engineers or keystone species, due to the outsized impact of their behavior on local ecosystems. The teeth of beavers, like those of other rodents, keep growing throughout life. Without their remarkable teeth, they would be unable to cut trees and create dams.